I love Stampin’ Celebration challenges…they are a little different than some of the other card blog challenges I work on! The inspiration pictures for each challenge have so many elements, which open up lots of possibilities to create an awesome card or project! This is the latest challenge…there’s cherries, kraft, gingham, reds, a little pop of yellow…and that’s just what I noticed at first glance…I know there’s got to be more hidden in the pictures that I didn’t draw from! The stamps are from Crafty Secrets. I’ve had them for a while, but have never used them on a card before. The cherry patterned paper is from October Afternoon and the red dot paper is from Graphic 45. Instead of green gingham ribbon, I used blue because the scrap of green ribbon I had wasn’t long enough! The cherry brad is from Creative Imaginations and I added a white paper flower from Imaginisce with a little yellow button for the center. The inks I used were Stampin’ Up Soft Suede and Colorbox chalk ink. 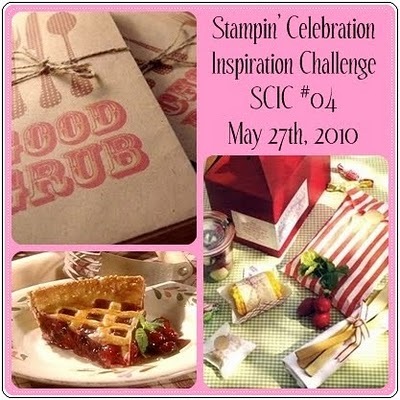 Thanks for looking, this was another fun Stampin’ Celebration challenge! Cute card! Love the little flower on her hair. Suzanne this is fabulous! 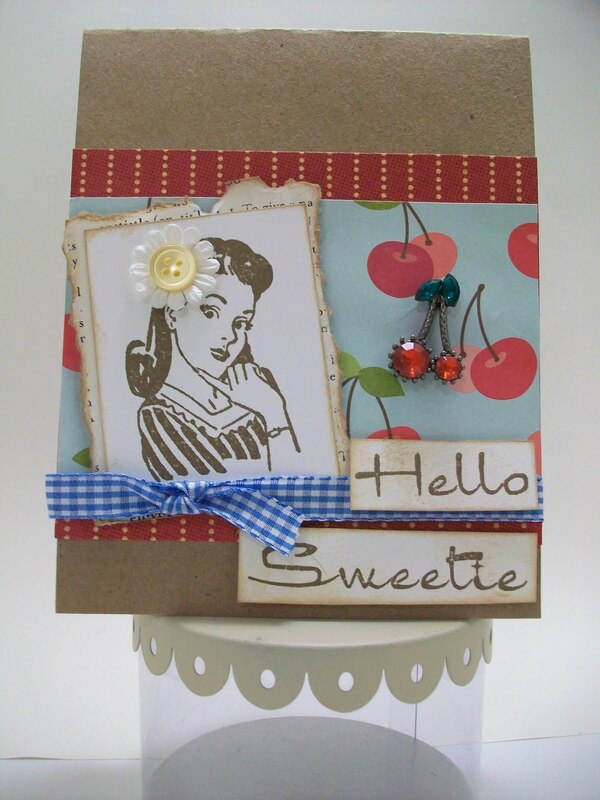 Love all your fun elements, especially the blingy cherries, adn the torn edges of your main image. Too cute!! Thanks for playing along at the SCIC!